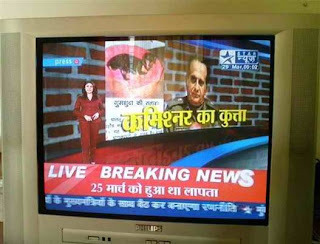 With the launch of more than a dozen news channels in India there is a war for getting news on these 24 hour news channels. 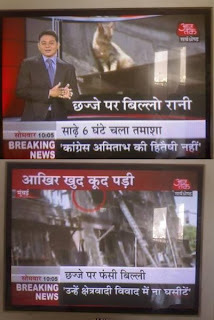 Since there is nothing better to put on air the channels have come up with these unique news items in the garb of breaking news. Here is a sample of screen caps I got in an email. 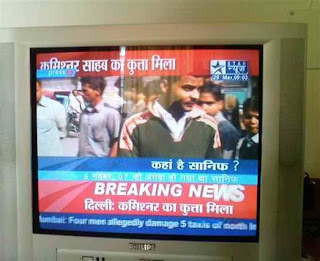 Just shows what these channels have to come up with in the name of BREAKING NEWS. BREAKING NEWS:Kitty got stuck on the roof. BREAKING NEWS:Amitabh Bacchan (Bollywood actor) felt cold . 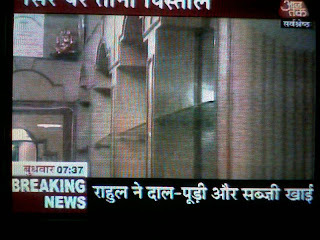 BREAKING NEWS:Rahul Gandhi (an indian politician) had dal, poorie and subzi (menu of items he had for lunch). Yeah! you can go ahead. 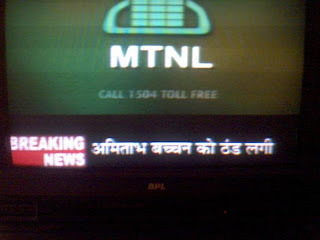 But, seriously all hindi news channels in India are crap(only ndtv india is somewhat bearable).